With summer vacation drawing to a close, I wanted to do a short solo trip to a place I'd never been. Being a cast geek, I decided to travel to eastern Oregon to see the Blue Mountains where Paul Freeman obtained numerous sasquatch footprint casts throughout the 1980's and 90's. Paul Freeman's casts have a checkered reputation. Some bigfooters believe that all of Mr. Freeman's casts were hoaxed, while others believe that none of them were. While I do admit that some of the casts don't look quite right to me, many of them show interesting anatomical features that are consistent with great ape anatomy. Certainly Mr. Freeman was not an expert in biolocomotion and ape anatomy. (A friend of Freeman's recently told me that Paul "wasn't an expert in anything.") Academic authorities, such as Dr. Jeff Meldrum, have weighed Freeman's evidence and found many of the casts to be quite compelling. Until I obtain a PhD from an academic institution, I'll defer to the experts. The Blues are about a four and a half hour drive from Portland. Getting an unhurried start, I found myself passing through Walla Walla, WA in the late afternoon. I turned onto Mill Creek Road and headed to the hills. The terrain soon turned from low, brown, rolling hills into steep canyons with lush river bottoms. Homesteads and farms dotted the landscape as I drove to higher altitudes up the winding gravel road. 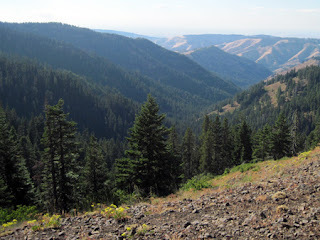 Reaching the ridgeline, I obtained my first view of the legendary Mill Creek Watershed. 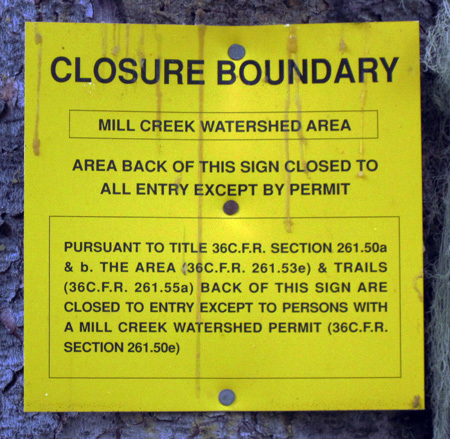 Mill Creek is the water source for the city of Walla Walla, and therefore is off limits to nearly all human traffic. Only a few government employees and a very small number of elk hunters who get lucky enough to pull a tag for this area are allowed into the watershed. For the vast majority of the year, the bigfoots pretty much have the run of the place. 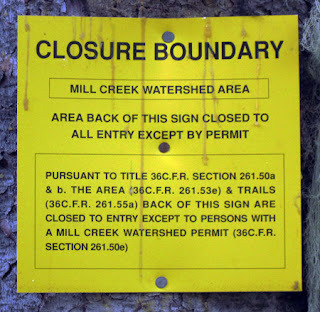 These signs were posted along the road bordering the watershed. My first stop was Deduct Springs, the site from which several casts in my collection were collected, as well as the location where Paul Freeman obtained his famous 1994 video. I was told the area had changed significantly since the film was shot, which was true, but the rumor that a parking lot had been built was false. There is no pavement there, only a pit toilet and a trail head sign next to a pond. 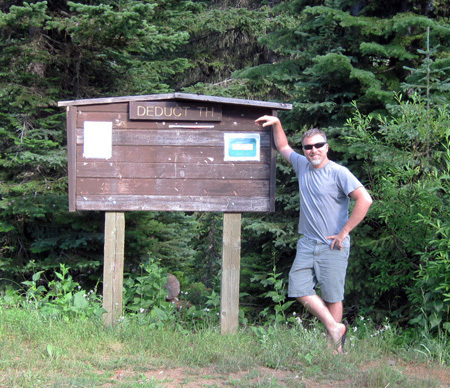 The Deduct Springs trail head sign. There was an amazing array of yummy smelling grasses and herbs growing in the area of the springs. A small creek trickled into a pond across from the trail head sign, so I plunged into the undergrowth and followed it to its source, looking closely at the muddy ground along the way for signs of sasquatches. No sign was encountered, but no ticks were encountered either. I was thankful for that because I'd heard that the Blues can be thick with ticks during certain parts of the year. Ticks, and in fact arachnids in general, are not endearing to me at all. 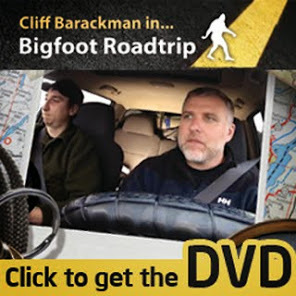 Paul Freeman's bigfoot footage, filmed at Deduct Springs. After poking around Deduct Springs for a while, I hit the road again. There is a large number of springs popping up here and there all throughout the Blues, so I made it a point to stop at every one that was near the road in order to search for footprints. I didn't have to drive far to find springs, but footprints eluded me wherever I looked. Driving northward on a very dusty road, I found an isolated campsite called Indian Camp, also the site of Indian Springs. The campsite was at a trail head above the Wenaha-Tucannon Wilderness Area. There were plenty of deer around, as judged by both the sheer number of footprints, and also that two of them kept coming to within forty feet of me, then running off if I made any sudden moves. My night was spent in this valley making calls and knocking, but receiving no responses. How did the rest of your trip go? Did you return for more exploration?